Year after year, saving money and eating healthier rank high on the list of New Year’s resolutions, but as many know all too well, busy schedules can make it hard to keep these resolutions up. “Pretty Delicious” author and “Top Chef” alum Candice Kumai has partnered with The Glad Products Company to create delicious recipes that help bring healthy food out of the kitchen, and in turn, help to save you both the cost and calories associated with eating lunch out. Chef Kumai’s recipes are inspired by Glad To Go reusable lunch and snack containers, which feature a detachable 1.5-ounce “To Go” cup that snaps into the lid — allowing you to confidently transport foods that you haven’t been able to before. 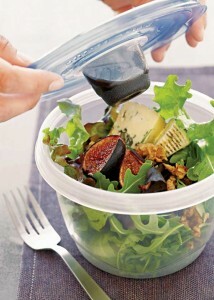 Just imagine — no more dressing leak disasters when bringing a salad to work. 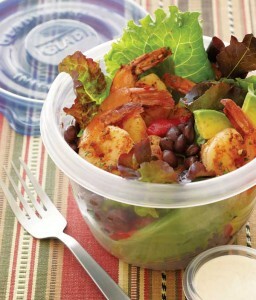 For additional recipes, lunchtime tips, coupon offerings and more, visit www.Facebook.com/Glad. Add olive oil to a large skillet over medium heat. Once oil is hot, add chopped garlic and cook for about 1 minute. Add cumin and red pepper flakes, and let flavors blend together. Add shrimp and toss. Carefully add tequila and cook until alcohol burns off. Season with salt, and add dried chipotle powder. Once shrimp are cooked, add chopped cilantro, toss and put aside on a plate. Toss mixed greens in a large salad bowl and add in roasted red peppers and black beans. In medium bowl, whisk all of the dressing ingredients together and alter to desired taste by adding additional hot sauce and salt. Top with avocado slices and sautéed shrimp. To roast figs, preheat the oven to 350°F. Remove stems off end of each fig, then slice fig in half. Roast for approximately 30 minutes or until a bit golden brown. Remove and cool slightly. In small mixing bowl, mix 2 tablespoons balsamic vinegar, olive oil and honey. Add figs and toss to coat evenly. Marinate for 5 to 10 minutes. Whisk honey, mustard, 1/4 cup balsamic vinegar and sea salt together to create dressing. Place greens in large salad bowl; toss in candied walnuts. Serve with two fig halves on top of each salad with a blue cheese wedge. Place walnuts on rimmed baking sheet and bake until fragrant and toasted, about 8 minutes. Transfer to a plate to cool. Toss spinach with strawberries in a large bowl. In small bowl, whisk together honey, mustard, vinegar and salt. 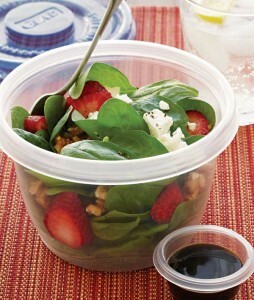 Sprinkle walnuts on top of spinach and strawberries mix. Serve sprinkled with goat cheese, with remaining dressing on the side.